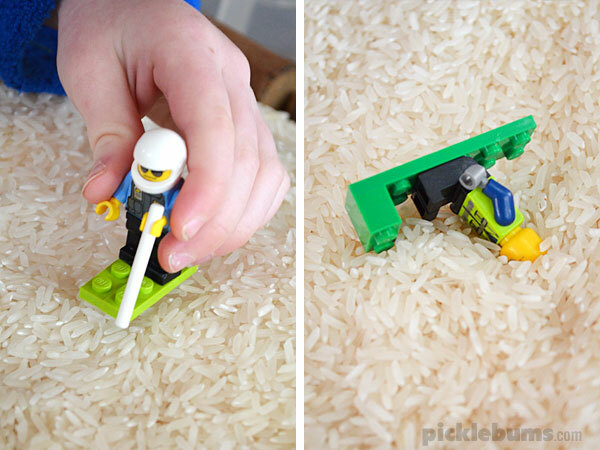 Snow Slope Imaginary Play – following a child’s interests. It’s cold here at the moment. Everyone is talking about the weather and how cold it has been. Everyone is asking us whether it has snowed at our house. It is a hot topic of conversation and something Noah (aged 5) can’t stop talking about. “Is it cold today? Is there ice outside? Will it snow at our house? Can we go to the snow? It very rarely snows at our house, even when it is unusually cold like it has been, and apart from a sprinkling of snow on top of our near by mountain we’ve not seen actual snow since we visited a ski resort last year, but Noah is really, really, interested in snow right now. 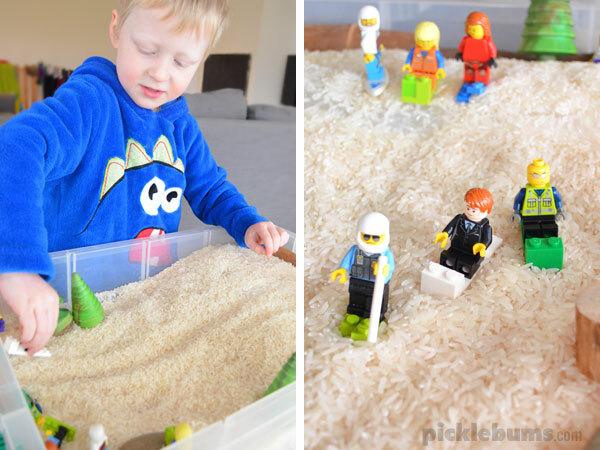 With Noah’s interest in mind, we created a simple snow slope imaginary play set up. Here’s how we made our snow slope imaginary play. A tub or container – we used a small under-bed storage container. Something to make the shape of the slope – we used some bubble wrap but you could use material or a cushion. Some white rice – or you could use cloud dough. Some accessories – we used wooden trees, some wood off cuts, sticks and stones. 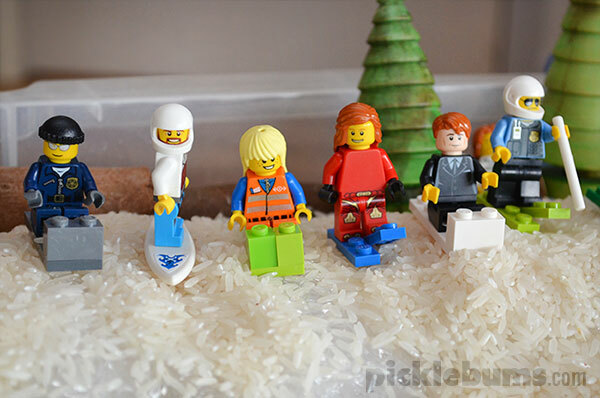 Some people – we used Lego people and lego blocks to make ski’s, toboggans, and a cool snow board. We rolled the bubble wrap at one end to make a nice gentle slope, then we poured in the snow… I mean rice. We put together some Lego people and made skis and toboggans for them as that is what Noah remembered seeing when we went to the snow last year. As he played with the snow slope he talked about when the snow went down his back last year, and how it was cold and wet and he didn’t like it. We raced toboggans down the hill just like he had done with his Dad last year. After a while I wandered a way and left him to play. As I worked at my computer, I could hear Noah chattering as he played. I heard him crash a person into the snow and exclaim about snow getting down his back and how he wanted to go home because he was cold. It was a recreation of what happened when he visited the snow, and it was interesting to hear him voice another person telling the cold wet guy that he’d be alright, that he could change his wet shirt and get warm and keep playing. This was a really simple imaginary play set up, but because it was inspired by one of Noah’s current interests it held his attention for a long time, and he revisited the set up often during the day. Magic happens if we let our children’s interests lead their play and the activities we offer them. What happens when we follow our child’s interests? 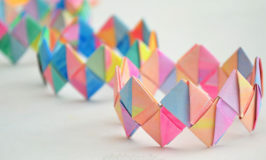 They are more engaged in the activity and show longer attention spans. They can act out and recreate situations they have experiences to help them feel better or make sense of what has happened. They build on their current ideas, explore possibilities, and find answers to questions. They are more likely to play independently for longer periods of time. They learn that their ideas and interests are important and worth pursuing which builds self esteem. What are your children interested in right now? 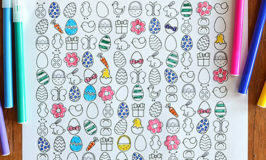 Could you set up an easy imaginative play scene inspired by their interest? 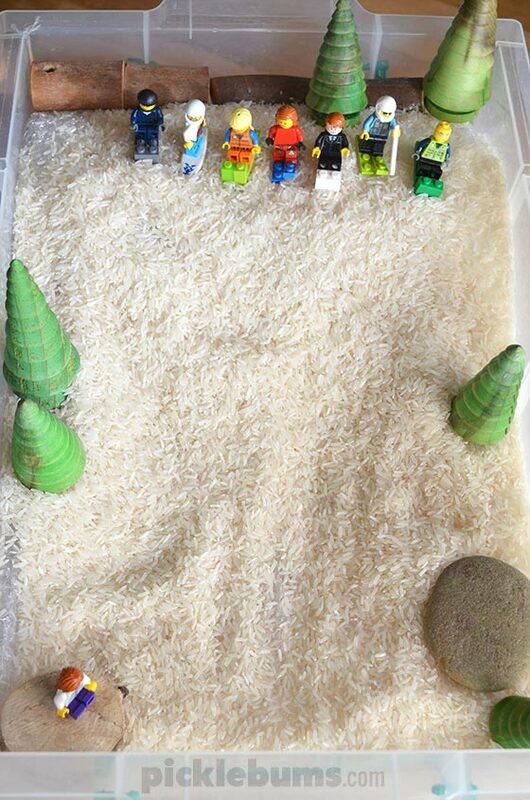 Perhaps the weather is a little warmer where you live and a beach imaginative play set up might be what your kids are interested it? 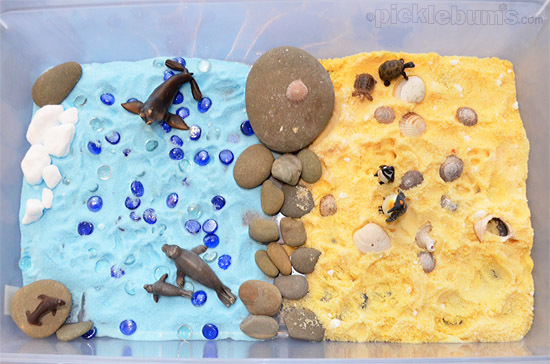 Try this ‘At the beach’ salt tray set up. 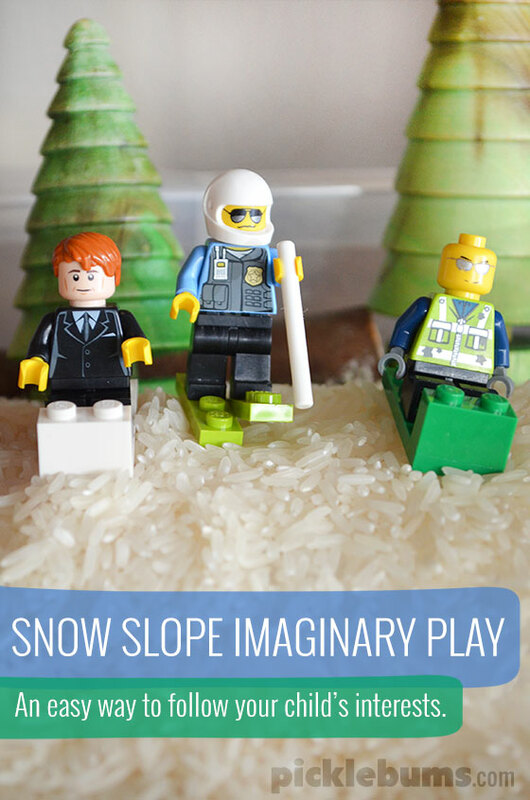 Home » Snow Slope Imaginary Play – following a child’s interests.